Mohabbat Tumse Nafrat Hei Episode 22 Review – Good One! This drama has finally picked up pace and it seems like the viewers will probably get to see few interesting and happening episodes as the drama is headed towards a climax worth looking forward to. There are still a lot of questions which need to be answered and it is impossible to predict how the drama will end since there is still a chance that Waqar can explain to everyone what actually happened. This will however open a new Pandora box but it will turn things around for Waqar and Maheen in particular. The opening scene of tonight’s episode showed Neelam breaking the news of Waqar and Maheen’s marriage to Gulrez. Although Gulrez’s initial reaction was that of shock but later on he proved that he was much more brave than everyone else around him. There was a time when I did not feel anything for Gulrez but watching him support Waqar and Maheen like that was heart-rending. Watching Waqar and Maheen having a normal conversation for a change was the highlight of tonight’s episode. This was the first time that these two did not argue with one another but actually talked about things which mattered. Imran Abbas and Ayeza Khan’s on-screen chemistry and the way these scenes were shot was perfect. Both these actors looked great and acted superbly too. It was also good to watch them discussing Gulrez. Ami Begum played a major role in making Waqar confess his love for Maheen. If it weren’t for her, this marriage wouldn’t be taking place at this point. I have to say that Ami Begum redeemed herself tonight and I have forgiven her for every silly game she played in the previous few episodes. The second scene of this episode looked like an extension of the scene that was shown in the 2nd episode in which these gang members took Gulrez’s car away. Ali made an appearance after a long time tonight and I have to say I missed his character. Even though he does not have a big role to play in the story but he was introduced as an important character therefore I feel he should have been part of every other episode if not all the episodes. 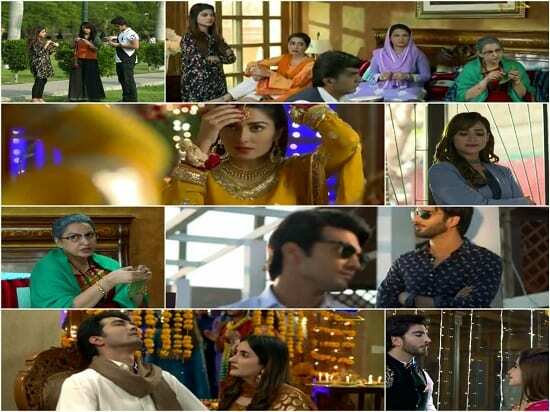 Jia is all set to take revenge from Aurangzeb and the preview of the next episode suggested that Maheen’s declaration of love for Waqar will prove to be the reason why she finally goes ahead with her plan. Jia has always been shown as a negative person therefore it never came as a surprise that she planned something like this. It is however difficult to understand why no one ever suspected her since she can be very transparent at times. Jia’s father is completely out of the picture for now which basically goes to show that there are too many characters in the play but the screen time has not been distributed properly among all of them. Overall, this was an interesting episode of Mohabbat Tumse Nafrat Hei which gave me a reason to look forward to what this show has in store for us in the coming weeks. I hope things continue to move forward with the same pace right till the end.